There were a lot of new faces at IpBoG this week. Maybe it's the post-Christmas surge. Is that a thing? Maybe it's a thing. If you're reading this but you've not attended yet you should probably come along. I started off my night with not just Sushi Go, but Sushi Go Party. It's a game with a box so bad the rule book doesn't fit in and no one really understands how it's meant to be packed. Apart form this it's pretty much a variable Sushi Go, with different cards that you can swap in an out. It also means some of the cards are a little confusing if it's the first time you've seen them but we fumbled through alright. 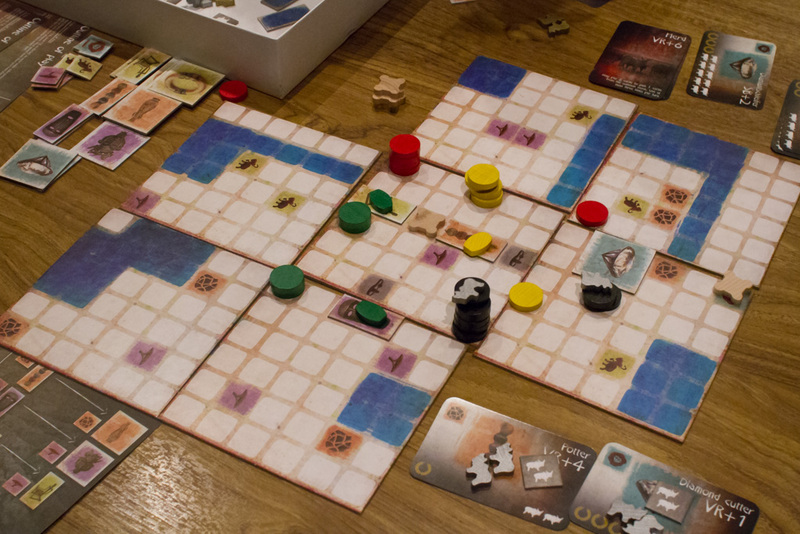 Afterwards I played The Great Zimbabwe, published by Splotter Spellen who are usually known for their very long, complex Euros. This one however you can get through in under an hour. Once you get then hang of it it's a pretty unique and interesting game, even if it does have the low production quality that plagues Splotter games. I saw a whole host of other games being played from the dice rolling of Tiny Epic Galaxies and King of Tokyo to the deduction of Spyfall and Mysterium. And also No Thanks! and Monikers. At one point there were games of Bang! and Bang! the Dice Game being played at the same time, it seems to have had a bit of an IpBoG resurgence of late.